Although he was born & bred in New York State, Steve Conte started his musical career at the New Jersey Shore. Raised by his jazz vocalist mom, Rosemary Conte, he cut his teeth on her repertoire of Billie Holiday & Frank Sinatra standards, along with the music of his heroes; The Beatles & Stones, Bob Dylan, Chuck Berry and Simon & Garfunkel. Steve’s first “album” of original songs was recorded in the family living room when he was just 10 years old. Growing up in the ‘burbs he played all the usual spots; teen dances, folk festivals, talent shows and private parties, but when presented the options of moving to NYC to pursue fame & fortune or going to college to better his musicianship, he chose the latter. Five years later, armed with an education, Conte moved to NYC and began a fruitful career as a musical artist and a sideman. He started doing “pro” gigs in the mid/-to-late 1980s with the legendary jazz-rock group, Blood Sweat & Tears, NJ’s own Glen Burtnick and Charlie Midnight and Prince & The Revolution singer, Jill Jones. Within two years of living in New York, Conte was offered a recording contract by Mercury records for his band, Company Of Wolves. The band’s eponymous 1990 debut also featured his bass playing brother John Conte (currently a member of Southside Johnny & The Asbury Jukes who has also played with Jon Bon Jovi, Roseanne Cash and Ian Hunter.) Following The Wolves breakup in 1992, the brothers made 3 critically acclaimed indie albums; Linoleum and Spitshine under the name, Crown Jewels and Bleed Together as The Contes. To pay the rent, Steve stretched his sideman chops by working with such diverse artists as Willie Nile, Paul Simon, Simon & Garfunkel, Willy DeVille, Peter Wolf, Maceo Parker, Billy Squier, Yoko Kanno and Eric Burdon. In 2004 he got a call from David Johansen and joined the legendary New York Dolls as guitarist, backing vocalist and co-songwriter, making 4 albums with them and touring most of the globe. In 2010, Conte left New York Dolls and took his playing, singing and writing skills abroad, teaming up with Michael Monroe, former front man of the Finnish band Hanoi Rocks. They released 3 albums, most recently, Horns And Halos (Spinefarm Records, 2013) on which Steve wrote the lion’s share of the songs. 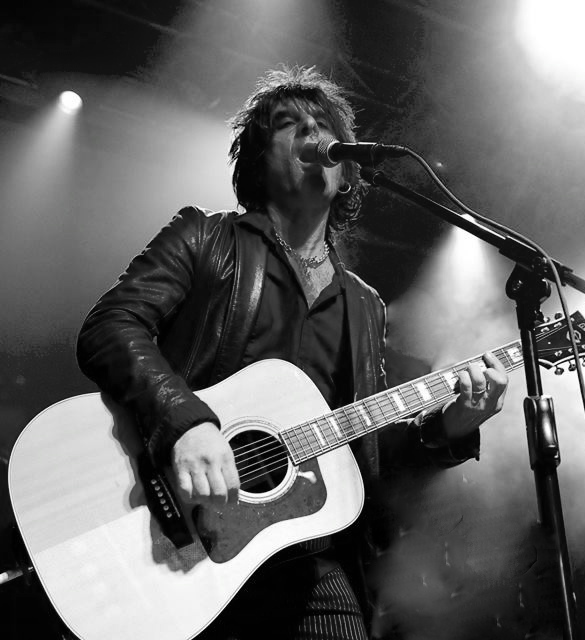 In the summer of 2011, in between tours with Monroe, Conte began work on what was to become his first official solo album, naming the project Steve Conte NYC. When he wasn’t working on songs for his new project, Conte took advantage of living in the EU to tour extensively, hitting England, Scotland, Holland, Belgium and France with a Dutch version of his NYC band, calling it – “Steve Conte & The Crazy Truth International”. And in 2014, after years of making records with others, Steve has stepped out on his own to release, ‘The Steve Conte NYC Album’. The self-produced, ten-song album features some of Conte’s finest writing to date. Songs that hold up in a solo acoustic performance – but recorded with a totally rockin’ band. is an Americana, Roots Rock ‘n’ Roll, storytelling classic – with guest performances by members of Foo Fighters, Ryan Adams & The Cardinals, Georgia Satellites, Mink DeVille, The Wallflowers, New York Dolls, Alice Cooper, Mott The Hoople, Hanoi Rocks, Hellacopters, The Wildhearts, The Urban Voodoo Machine, Backyard Babies, Company Of Wolves, Southside Johnny & The Asbury Jukes, Ian Hunter, Rosanne Cash, John Mellencamp and Bruce Springsteen. “Little Steven” Van Zandt of Bruce Springsteen & The E Street Band and actor on The Sopranos and Lillyhammer recently discovered the album and states that it is, “Without a doubt, on of the best records of the year!” Van Zandt added five of the album’s tracks to the playlist of his Sirius/XM Radio program The Underground Garage, one of which he crowned the “Coolest Song In The World”. The album was mixed and mastered by Niko Bolas (Neil Young, Keith Richards) & Richard Dodd (Tom Petty, Counting Crows), respectively – the same team who did the 2009 release, “Steve Conte & The Crazy Truth”.